Mike Finnigan was born in Cleveland, Ohio in 1945 and was raised in Troy, Ohio. He grew up in a musical family, in which both parents and many relatives sang and played music, in a home where all kinds of popular American Music was heard constantly. Finnigan had some piano lessons in his childhood, but was more interested in the drums, which he started playing at age 11. He returned to playing a little piano in his teens and was part of a band with some high school friends before leaving Ohio in 1963 to attend Kansas University on a basketball scholarship. It was in Lawrence, Kansas, just 20 miles west of Kansas City, that he began his career as a musician. Kansas City was still a place that offered a good deal of live music in that era, and Finnigan started spending a lot of hours in KC, listening to the many fine musicians playing Jazz, R&B, and Rock music. He soon joined a group of college classmates in a band called The Serfs, bought a Hammond organ, and started playing gigs. It was something of a miracle that the 19 year-old Mike Finnigan came to own a Hammond organ in the first place. There was a Hammond store in Wichita back then and the man who ran it was a retired musician, who played the Hammond organ, named Bob Hall. Bob took an interest in the teenager who was haunting the store regularly and extended a hand of friendship. Mike didn’t have the cash to buy a B3 and Leslie speaker, and he certainly didn’t have any credit, but Bob let Mike put $200 down and agreed to carry the loan himself. That event ranks as perhaps the most important in Mike Finnigan’s career. Mike left college in 1964 and moved to Wichita, Kansas for the next seven years, traveling the country with The Serfs and playing in nightclubs, and later, theaters and other concert venues. The Serfs were signed to Capitol Records in in 1968 and it was during the band’s recording of their album in New York City, that Finnigan met and recorded with Jimi Hendrix at the Record Plant. The album was Electric Ladyland and the tracks on which he provided Hammond organ introduced Mike Finnigan to a much wider audience. In 1970, jazz guitarist, Jerry Hahn contacted Mike and offered him a gig with a band he was putting together in San Francisco. The band was The Jerry Hahn Brotherhood and they did an album for Columbia Records that was among the first “fusion” albums recorded. Since then, Mike has done several band projects – Finnigan & Wood (Blue Thumb), The DFK Band (Columbia), three albums with The Phantom Blues Band (Delta Groove)– and two solo albums – Mike Finnigan (Warner Bros) in produced by the legendary Jerry Wexler, and Black and White (Columbia). Finnigan is best known for his Hammond organ (and vocal) contributions to dozens of recordings, by a wide variety of artists, over the past 50 years, appearing on albums with Crosby, Stills & Nash, The Manhattan Transfer, Jane’s Addiction, Etta James, Dave Mason, Joe Cocker, Dan Fogleberg, Ringo Starr, Maria Muldaur, James Ingraham, Tracy Chapman, Rod Stewart, John Hiatt, Leonard Cohen, Buddy Guy, Sam Moore, Curtis Salgado, Keb Mo, Taj Mahal, Bonnie Raitt, and many others. 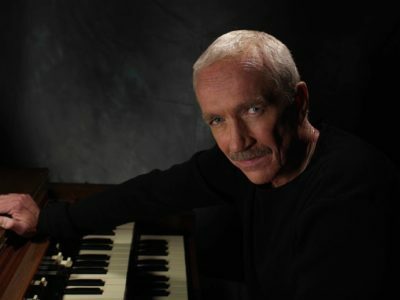 Additionally, Finnigan has provided Hammond organ to numerous film and television scores – and commercials – over the years. In 2000, Mike shared in the ‘W.C. Handy Blues Band of the Year’ Award as a member of Taj Mahal & The Phantom blues Band. Mike was inducted into the Kansas Music Hall of Fame in 2005, and as a co-writer, shared in the Blues Foundation Award for the 2016 ‘Blues Song of the Year’, for Curtis Salgado’s recording of Walk a Mile in My Blues. Since the mid-‘70’s he’s been on the road steadily, touring with Dave Mason, Maria Muldaur, Crosby, Stills & Nash, Etta James, Joe Walsh, Tower of Power, Michael McDonald, Joe Cocker, and Bonnie Raitt. Mike and his wife Candy celebrated 48 years of marriage in October of 2017. They have two grown children, daughter Bridget, and son Kelly. Mike and Candy have lived in Los Angeles, California since 1975.